Today we met with Han Yeongyong, Head Chef and owner of Keungiwajip, a one-Michelin star restaurant specialized in a delicious crab dish called Ganjang gejang (간장게장). Opened by his family more than 30 years ago, in this restaurant they take special pride in offering only the freshest and local crustaceans, and in their special soy sauce fermented for more than 10 years. We sat down with the chef in his studio in the back of his restaurant – traditional Korean music playing in the background with a hot cup of tea to start the conversation. How did you become interested in food and became a chef? We move to the table where our lunch was prepared for us – many dishes arranged in front of us – at the center of the table the delicious cured crab. Our conversation resumes on the proper way of eating Korean food and appreciate our meal. The chef explains how we should eat Korean food in order to enjoy the meal at its best. “First thing is to smell and taste the rice. Rice (bap) is a staple of Korean cuisine and we should think and appreciate the meal we are about to consume. Second step is tasting the soybean paste soup (dwenjang guk). In our restaurant we use few ingredients and the taste is very clean. Next step is to taste the kim (sea weed) and appreciate the sea flavors it has. Then taste the broth made with soy sauce used to cure the crab. Lastly, taste the kimchi – this is a 3 years old kimchi made here in our restaurant. 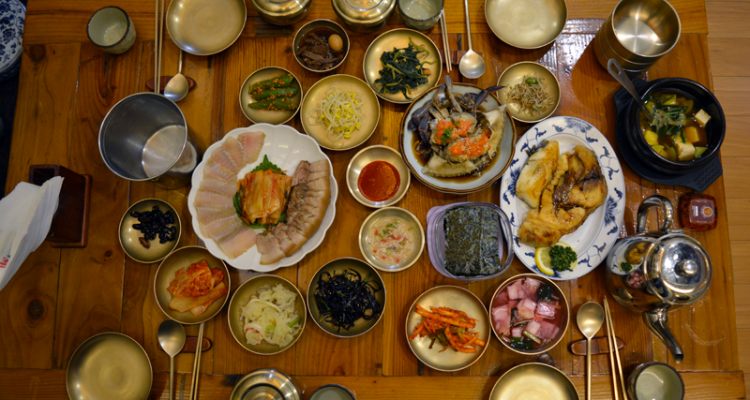 One of the peculiar aspect of Hansik is that during a Korean meal the dishes are served all together so when preparing a meal the chef always have to think about the balance of the whole meal. 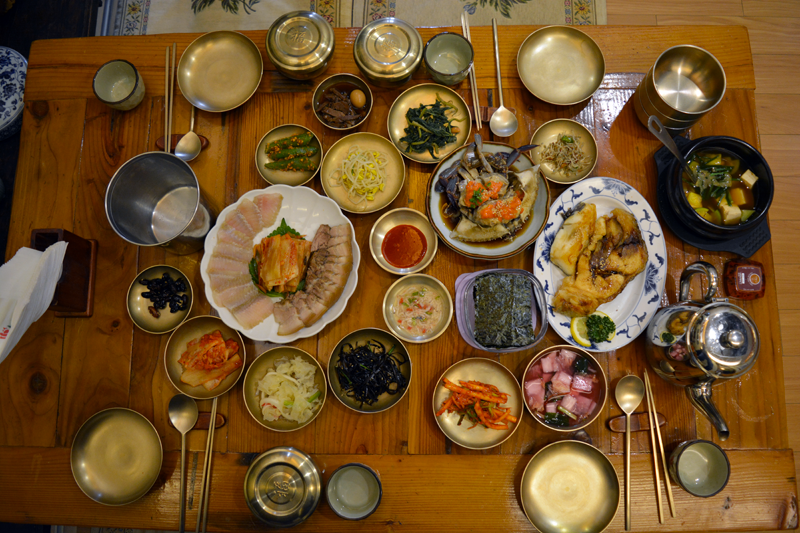 Rice, soup and banchan (side dishes) all have to balance each other. Not only that. In Western cuisine dishes are served in courses and each persone get their own dish. In Korean this doesn’t happen and all dishes are shared. That’s why we also have to consider the other people we share the meal with when eating Korean food: how much I am going to eat, how will I pick up the food or cut it so the next person would be able to eat easily and pick their food comfortably. You worked on globalization of Korean food before. What in your opinion should be promoted about Korean food? 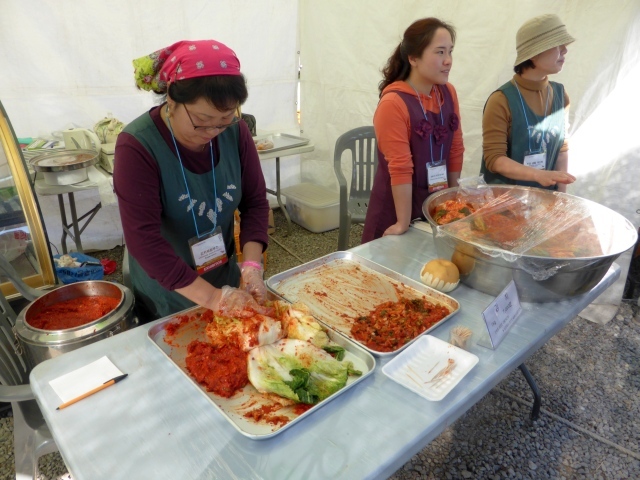 In Italy Korean food is not popular yet if compared to other Asian cuisines. “Japanese food is a good example of successful globalization but Korean food is still lacking behind. When foreigners think about Korean food they only know few dishes like bibimbap, japchae or tteokpokki. Raw fish and rice are often consumed in Asian countries and for Japan they have become representative dishes of their cuisine. I think Japanese food is a bit more approachable, less spicy, and has milder flavors compared to Korean Food. “Yes, this is another issue. Korean restaurants abroad, especially in Europe, don’t use original ingredients and don’t adapt their dishes to Western palate. I think the Korean food can become popular as Italian food and from the food people could learn about our culture. When did you get the Michelin star? Achieving the Michelin star changed something for you? What is the achievement for the next 10 years? “I think that for contributing to the globalization of Korean food it’s important to find a good spirit to match the food. 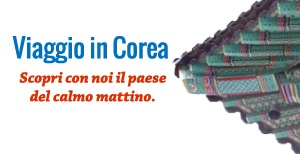 (TN: Korean word for food is “음식” – 음means drink and 식 means food). I want to research on this topic and make a Korean fine wine that could accompany our food. In other countries when ordering food you also choose drink to go with the food (wine) but in Korea they don’t take matching drink with food too seriously, mostly only soju and makgeolli. But both of these spirit are usually cheap alcohol and not fine spirits. So my plan for next ten years is to study more about fine wine and spirits and want to find a fine Korean wine to match with Korean food. Did your college studies in fermentation helped in your work at the restaurant? Keungiwajip is one of the first Korean restaurant being awarded a Michelin star in Korea. Their family tradition and consistency of the recipe have made their signature dish one of the best you can enjoy for the price range (around 50,000 won per person). A good opportunity to taste a delicious dish in a comfortable atmosphere. Chatting with chef Han Yeongyong was really interesting, and I learned more about the proper etiquette when eating Korean food. Considering the others is something that defines Korean culture and you should keep in mind when enjoying a meal with somebody.